Sipsmith is opening a pop-up cocktail bar on Ham Yard Hotel's rooftop, just 2 minutes from Piccadilly Circus. There will be blankets to wrap yourself in, and the cocktials are warm - including Hot G&Ts and Steaming Juleps. It's booking only (to control numbers) and your £14 ticket gets you the first drink for free. Open Tues-Sun for 3 weeks from 26th January. 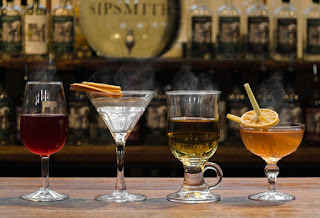 "Sipsmith, passionate pioneers of London’s artisan gin renaissance, has teamed up with Ham Yard Hotel to serve gin-laced winter warmers on the hotel’s hidden roof terrace from the end of January until mid-February 2016. Wrap up in woollen blankets on Ham Yard Hotel’s rooftop with sweeping views over the London skyline and find yourself sipping on historically-inspired warm drinks including Hot G&Ts and Steaming Juleps. Sipsmith Master Distiller Jared Brown and Ham Yard Hotel Bar Manager Eoin Kenny have delved into London’s drinking past – from the 16th century right through to the 1920s – to craft a very modern menu. The pop-up will run from Tuesday 26th January until Sunday 14th February (excluding Mondays) in timed sessions. Tickets cost £14 per person, which includes a complimentary welcome drink and an introduction by one of the Sipsmith team."